Hawkins\Brown Architects has designed a 650-home estate for Peabody at Clapham Junction that more than double the capacity of the existing development. The proposal is a test scheme for the housing association‘s future vision, released this week, which was drawn up by Terry Farrell. Every home in the estate will have outside space and be build to exceed level 4 of Code for Sustainable Homes. The scheme will be funded though a combination of social housing grants, the sale of private homes and low-carbon initiative grants. According to an article in BDonline, Hawkins Brown (which won an international competition to reappraise the Peabody Estate’s Clapham site in south London – have you heard about this in Brightside?) 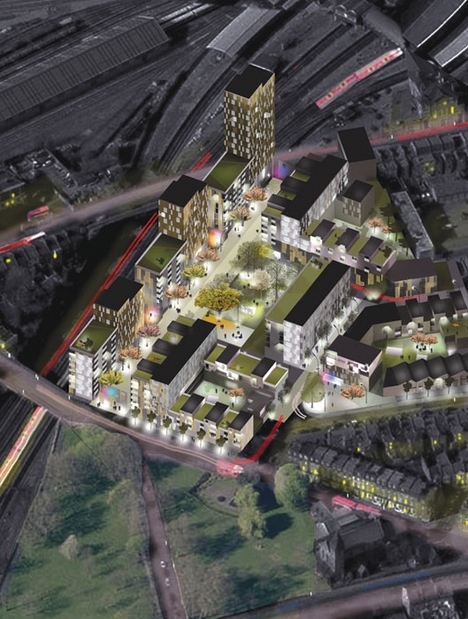 is drawing up plans for a £100 million estate regeneration that is being described as a template for the future of social housing. The firm, has now been given the go-ahead to draw up detailed plans to double the number of homes, enlarge properties and give all residents private, outdoor space. 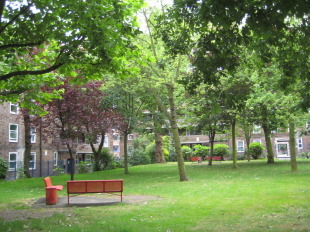 According to the website, Hawkins Brown director Wayne Glaze said there was a pressing need to reconnect the Clapham estate to its surroundings. However a criticism on the article wonders how they can achieve private outdoor space and still make the estate open to the surrounding community with the number of flats and even a tower block included. The tower (which because of the seventy foot tall hill that it sits on) will already be seven stories higher than the ones in Grant Road and is bound to ‘read’ very strongly when looking up St John’s Hill. There are also concerns on aspects of the overall density – plus uncertainties over sizes of units in terms of room numbers. It is hoped a planning application will be lodged next year for the three-and-a-half-year project to be carried out in stages. As requested in comments below, I provide a comparison of the current estate and the architect view. Information about Peabody Trust is available on their website. The properties are currently mostly general needs, apart from two of the blocks which are used for sheltered accommodation and a small number of market rented properties. The tower (which because of the seventy foot tall hill that it sits on) will already be seven stories higher than the ones in Grant Road and is bound to ‘read’ very strongly when looking up StJohn’s Hill. There are aspects of the overall density – plus uncertainties over sizes of units in terms of room numbers – that concern me too somewhat. No doubt it’ll be some time before this moves on from what look like quite high level concept drawings; and I suspect that if this does come to a concrete scheme it won’t bear much relation to what we see here (I reckon any private space will have to be shared if the upper floors are to benefit!). But this could be good news- the current Peabody estate is a pretty bleak and unwelcoming place, and creating a decent pedestrian link between St John’s Hill and Bolingbroke Grove – one that doesn’t feel like you’re trespassing – would be a definite plus for those living to the south west, particularly with the new station entrance being planned. Hmm. Whilst I too welcome anything that will improve conditions on the estate, is there anything about this proposal which seems just a little familiar? Could it be the cluster of tall buildings which will stand out like sore thumbs along Lavender Hill and St John’s Hill. It is a little difficult to tell from the projections, but there certainly appears to be a block of around 20 stories sitting smartly right next to the railway bridge on St John’s Hill. That would make the building taller by around 14 stories than anything currently existing in the area, placed prominently near the top of rising land just to make it a litte more oppressive. I also wonder how pleasant it will be for those living in the tower blocks overlooking one of the busiest railway lines in the UK? Time to question where the council is getting to with its policy on tall buildings? It is indeed a good idea to improve that area. With the new entrance for the station opening in Brighton Yard, it will be definitely a success for the estate. However I wonder why there is such a need for a tower (with the additional fact that, because located at the top of the hill, will probably be comparable to a 30 storey tower near the station). I understand that the architect thought about minimizing the impact from the street frontage by locating the tower at the very end of the estate [UPDATE: this is actually the opposite as you can see with the photos. 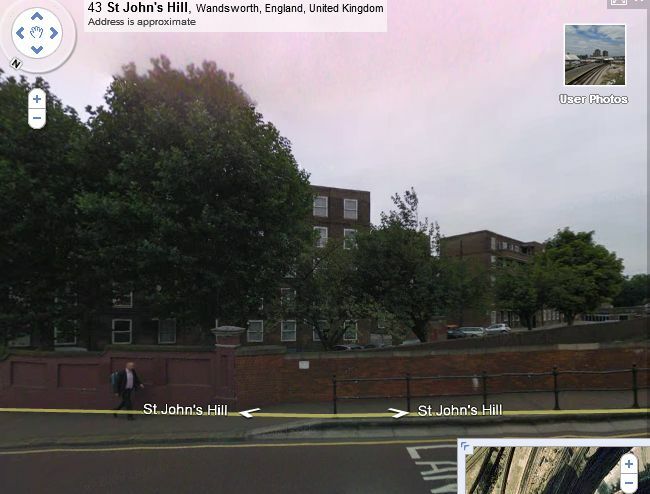 The new scheme create a fence of tall buildings on St John’s Hill, with the tower located on top of the hill]. However I really wonder what is the added value of packing residents in a tower looking down the railway, except for maximizing the site profit. Moreover I have strong concerns on the density of the development and the way they want to achieve their target to double the number of homes and at the same time give provide all residents private outdoor space and community space. For all those questions, and before we reach planning application, it might be a good idea to contact the developers and engage discussion. This has evolved from a scheme on which there was local consultation last year. There was a tower in the same position, but (if I remember correctly) only 11 storeys , against what appears to be 20 now. We drew attention to the tower as a possibly objectionable feature and suggested tall buildings might be better located in the middle of the site, rather than on St Johns Hill. In the proposed position it would clearly be a dominant feature in views up St Johns Hill. These have already been much affected by redevelopment of the Granada site. I assume the tower would be private housing, and that 11 storeys has become 20 because the sums did not add up. Peabody is a charity and has to find ways of financing the redevelopment. The Building Design piece to which Cyril has drawn attention touches on two other aspects of the overall scheme which came up in the original consultation. On is the amount of open space. Claims about this were questioned, and the answer seemed to be that all the car parking would be below ground but not underground (don’t ask me to explain that!). The other aspect is opening the estate up to the local community. Essentially this means integrating it into the street pattern west of St Johns Road. But another consideration was opening up the estate to Wandsworth Common. The scheme as it stands does not seem to realise the full potential in that respect, including the potential for opening up vistas from St Johns Hill and St Johns Road into Wandsworth Common. This is a major project and has been trailered locally before. The current exercise seems to indicate open acceptance that pre- application consultation is necessary. The project introduces green spaces and public access where effectively none exist currently. There has to be a close relationship between the built form and financial viability, and one assumes that the developers have done their sums. There is a high proportion of “affordable” homes proposed. I would not personally consider this to be an ideal family location but the scheme appears to make great strides into making this an urban scheme “fit for the 21st century”. It is certainly not a suburban location, as some of the detractors of the station scheme suggested. If one is going to have taller buildings at all and on this site then the logical location must be backing onto the railway as sensitive design can deal with aspects of sun light, daylight and noise and there are no sensitive residential neigbours immediately to the north of the scheme. The orientation also helps sunlight to penetrate the site. As readers of this blog will realise I don’t object to tall buildings as a building type necessarily. It will be interesting to see other local opinions as I feel we will see on this project in coming months a great deal of hypocrisy, as the developer in this case is seen as socially acceptable (and that’s fine) but private sector developers are roundly condemned on a blanket basis because they want to make a profit, even if that is often very modest indeed. That will have the challenging effect of clouding the tall buildings issue. There will be other regular contributors to this blog who seem to object to “regeneration” on principle. Surely this is a regeneration scheme too, but as it’s largely social housing that’s OK. Please forgive my cynicism. I think it might be interesting Cyril if you could outine on the Google map (sent to you) the estate as it is now. I can see one part appears to be built around a largish green space. How much of the map is Peabody Estate? I had heard of it but didn’t realise the location. Are the people living there now expected to move out? Will they be compulsorily purchased? What is the deal as far as they are concerned? Who will be making the profit… Peabody? The Peabody site (web) is too complex for me to have done more than glance but I saw reference to Housing Associations…I thought that meant shared ownership? So is it rented accomodation or a bit of both? …and if I remember rightly it was said that there would be more than twice as much housing in the space …and that doesn’t sound like an improvement! 1930’s stock is usually rather well built and spacious. It sounds like a developer inspired idea! Interesting that ‘Conversion carries a 17.5% VAT cost over ‘new-build’, therefore more ‘profitable’ to build new’. It says something on the plan about people having their own green space…but the plans make it look like it is shared space (albeit that can be quite nice). It looks, as usual,over-dense and considerably over-high in parts. Oh Yes and of course…any idea about Section 106 agreement? I am surprised that you have not heard of the Peabody Trust. They are one of the oldest independent providers of social housing and a charity going back well over 100 years. They are not a “profit” making organisation but I imagine like many realise that schemes have to be paid for. The means of paying for a socially based scheme are much more sophisicated than mere charitable giving and cross subsidy is but one tool to consider. Any designer of a project has to consider the financial and social implications of what they are proposing otherwise schemes just don’t get built. It’s recognised that different people have different perceptions of what is acceptable, and maybe at different times. Therefore what might be accepted at one point in history may become unacceptable for some, but then, after a while, opinions change again. Victorian terraced housing was, in the 50s and 60s considered horrible, and not homes fit for heroes. In many places in the world taller buildings are considered the thing to aspire to, even for families. Personally I believe many of the streets round CJ to be capable of improvement, including the Peabody Estate which has a rather grim bearing. I have been in flats there too. It may be however that they are well loved. Quite obviously there are large numbers of matters to consider, including the well being of existing tenants. Many may prefer the option of better accommodation. You shouldn’t assume they want to continue to live in such buildings. There are safeguards in place I am sure to ensure that the well being of such people is safeguarded during what is likely to be a long process, especially if it goes through a Youngs jungle. It all adds up to the fact that the provision of homes and other buildings being a vastly more expensive and lengthy process, which will drive shortage and price increases. Only 78000 homes were started in the UK this year. The population is estimated to grow by 10 million, and there is natural wastage. The next housing crisis is looming and in view of the fact that the economy has effectively been bankrupted by the current administration it hard to see where all the necessary investment, homes, other buildings and transport systems are coming from. Rising norms on space standards, sustainability etc are also adding dramatically to the cost of new homes. Architects have to work within the context of a large number of constraints set by society and it’s no good blaming them alone if the constraints later turn out to be the culprits. Thanks for the info. Yes, I had heard of Peabody estates; I think there is one near Soho. That doesn’t mean I am familiar with how they operate. I understand that we need housing and I am not against redevelopment of problem areas (which I have feeling this is, although I haven’t checked). 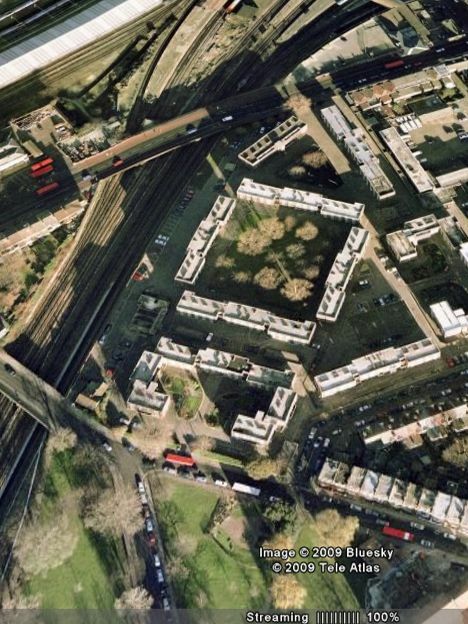 I can see from Google that a large block of not excessively tall flats surround a big green space. I don’t presume to interpret how residents see this situation which could be as a prison yard, or a private pleasant garden. I would like to know what the residents think. Just because a space can be developed to provide more housing doesn’t automatically provide justification for turning people out of their homes … that leads to a sort of facsim more associated with extreme left-wing politics, it seems to me. But that being said, yes, you may be right and people would be glad to live in a less rigidly designed environment. The current design looks quite nice apart from a few buildings which are too tall and without which we will almost certainly be told, the scheme is not viable. We are all for improvements; it is the price we have to pay for them that is of concern to us. No doubt they will have a tenant’s committee which will be consulted. It is however sometimes quite difficult to get representation as there is often a problem of disinterest. On the other hand ownership of those involved is essential and the danger of politically motivated outsiders trying to take the process over for their own ends is ever present. If it get’s planning I give it a start on site in minimum 3 years maybe more. Maybe 10% of tenants move every 12 months anyway. No doubt Peabody have accurate figures for this estate. There may be a tiny bit of truth in that but it does sound a bit like paranoia! None of the people I have come across concerned with these issues could be described in that way. As I see it, we are simply defending our own interests and those of the local community. It wouldn’t matter which political party had the reins, there would inevitably arise conflicts of interest over planning issues. Look at Livingstone who backed high buildings…and Boris who despite earlier statements to the contrary now backs them himself. They all have their motivations, most of them political, and we as a community try to defend ourselves against adverse consequences, never mind the politics! I updated the article with information regarding WBC tall policy documentation as well as photos comparing the existing estate with the architect view and views from the trees around. Contrary to what I thought at the first glance, the tower is actually located on the frontage of St John’s Hill with all the tallest buildings. 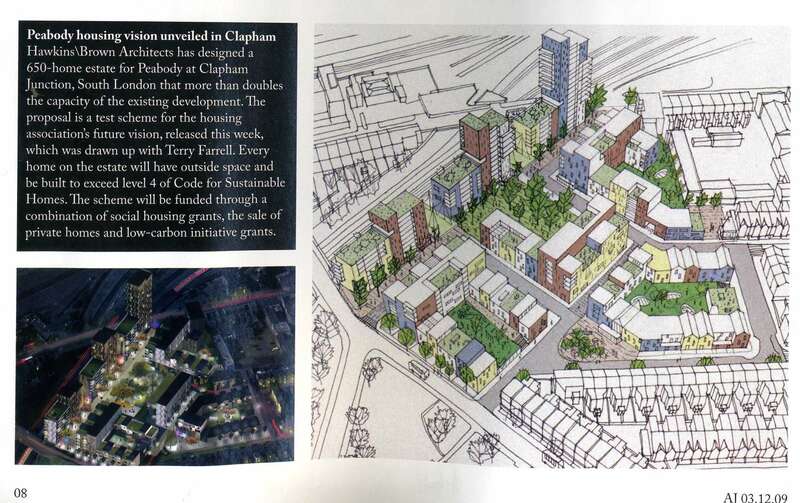 It seems in total contradictions to the guidelines provided in the site allocation document and will create a fence along the railway, as well as being the tallest buildings in Clapham Junction. In addition, as the photos show, open space is shrinking (not surprising with the high density achievement on the site) and a lot of the current nice old trees will be destroyed, including on St John’s Hill frontage to make place for a fence of concrete. Is it what local residents wish? The existing site layout in fact includes a very large amount of surface car parking and vehicle space which is of course completely unusable as amenity space, and pretty unattractive at that. I assume that the new proposals will take any essential car parking and put it below surface, thus releasing space for further development and re-allocate amenity and circulation space. Moving parking below ground would normally require demolition of existing buildings. My reading of the proposal is in fact that there will be much better overall distribution of amenity space across the whole site, and greater transparency of space for general public pedestrian access and circulation which should be planning gain. The treatment at any site boundaries need not be a “wall of concrete” along the lines of the Berlin or Gaza walls. I don’t honestly think that the scheme would propose the same, and more realistically I would hope that the details of any proposal when those become available (with buildings of whatever height is finally proposed) will show a more inviting aspect or prospect than what exists at present. David Rosemont: “I would hope that the details of any proposal when those become available […] will show a more inviting aspect or prospect than what exists at present.“> I cannot say less, and this is also my hope. However I am planning to contact the developers/architects/resident associations as there are some worries from the current information we have. Once again, another massive overdevelopment looms in Clapham Junction. The attractive 1930s buildings, which residents in general seem to like, are architecturally attractive, and have stood the test of time for the last 80 years are to be pulled down so that the Peabody Trust can build a massive overdevelopment (double the current number of units), with a series of towers that will destroy the skyline in Clapham Junction for years to come. Why have we still not learnt the lessons of the estates built in the 60s and 70s? 30s estates are generally praised for their low rise, well built, long lived nature, and have decent space standards. If this estate had been pulled down and replaced in the 70s with tower blocks it would be far less attractive, have far too many people for the site area, dominate the town centre, and the buildings would now be coming towards the end of their useful life. Why make that mistake now? The major problems with the Peabody Estate mentioned above are its cut off nature (a nature of the wall around it), and the poor landscaping within the site. These could be solved relatively easily (and for a very much smaller cost), by pulling down the wall round the estate, opening up pedestrian routes across it, getting rid of a large part of the car parking (which is almost always completely bereft of cars), and landscaping the surrounding area with tress bushes, grass, etc. The central gardens could also be significantly improved, up to the standards of London squares, by installing new railings, plantings, etc for a pretty small outlay. The flats themselves are actually of a pretty high standard when compared with most estates, and if necessary could be refurbished on a rolling basis. With a lick of paint and a few common sense improvements, the communal areas could also be massively improved. Again, for a very low cost. It seems that the only reason this scheme is proposed is to try and double the number of people living in the estate. This would be a massive over-development for this villagey Central London location, and should not be approved. Thought you might be interested in the history of the estate site. It was in more or less open country, probably cultivated fields up until 1853 when the site was sold to the Freemasons for a charitable school. The railways had already come but the site was noted for the “open wide aspects and country air” . The Royal Masonic girls school was housed in a great building(similar in kind to the Royal Victoria Patriotic building on the common). The Freemasons Arms (now Round House) and the Freemasons bridge over the railway by Emanuel School show the connections to this school. The school moved in 1926 and the site was bought by the Peabody Trust. When it demolished the school buildings the school’s two little lodge houses were left. It would be a great pity if these were to go in any redevelopment; they have character. One lodge is in Boutflower Road and one on the bend in Eckstein Road (It’s possible this one is no longer part of the estate). The present estate looks forbidding on the outside but there is a leafy communal garden in the middle which under the present proposals will be considerably reduced in size without much private space in compensation. The council’s LDF Site Specific document was not out when these plans were produced. It will be interesting to see how (if) Peabody will adapt to what is proposed for the site there. I don’t think any existing tenants will live in the new estate. They will all be rehoused before demolition of the whole site begins and they will not come back. George Peabody was a US philanthropist who nevertheless managed to get his name immortalised by the dozens of Peabody Estates & schools he had built ! The Peabody Trust are a very large social landlord in London, predating Council housing by many decades – they have over a dozen large estates in Wandsworth alone according to their website. I used to work in Pimlico, which has huge Peabody estates right left and centre – my office faced two of their estates. They were rather bleak Victorian affairs – think lots of tarmac and small dark courtyards covered in clothes lines. They were gradually renovating and modernising the buildings, and as far as I could tell they were decanting residents from block to block within the estate as this happened. The renovated areas had gardens and play areas, and were much more welcoming, though still a bit on the cramped side. The Clapham site’s so large that they will presumably redevelop this in stages – to do anything else would be quite a major project. My guess is that they’ll rehouse their tenants on other estates to some extent, as well as moving people into newer blocks at one end as they redevelop older blocks at the other. And if their work in Pimlico is anything to go by, I suspect they will recycle some of the existing buildings into the new scheme, with a bit of modernisation, mixed in with the new build. Peabody also own a good number of terrace houses on the Shaftesbury Estate, and there’s an old estate office with their sign on it buried away at the back of the estate – though as I understand it they have a policy of selling them off on the open market when they become available, as they tend to need a fair bit of investment and selling one £500,000 cottage can fund the construction of an awful lot of flats.